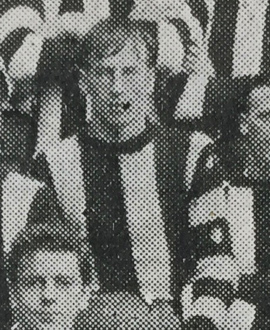 When Collingwood was in need of big men at the start of the 1910 season, they pulled two young giants from local sides to fill the temporary enforced absence of Les ‘Lofty’ Hughes. Andy Duff, 19, and Bertie McDougall, 20, were the two chosen from nowhere for the opening game of the 1910 season. As it turned out, that game was against Carlton, the team against which the Pies would play the grand final later in the same season – a game that would prove to be one of the wildest on record. Sadly, neither of the new boys would be around to take part on that historic day: McDougall played only the one game while the sandy-haired Duff went just one better, getting a second gig against St Kilda in Round 3. That wouldn’t have been the return Duff would have been hoping for when he lined up against the Blues in that opening round clash. He had made something of a name for himself as a follower of promise with Abbotsford (newspapers of the time recorded him as having come from Collingwood District, but there are no records of him having played with that club in 1909). He was very tall for his time and so filled a spot as the team’s tap ruckman. He filled the same role when he made it to the senior side, but his teammates were a little higher on football’s scale of greatness – captain George Angus filled the follower’s role and the controversial but brilliant Tom Baxter was rover. Together, they formed Collingwood’s ‘ruck’ in the two games that Duff played. Duff wasn’t overawed, and critics commented favourably on both his kicking and marking. But he was one of four Magpie newcomers that day, and the Australasian noted that none of them had lived up to their practice match form or expectations. He was dropped for the second game, returned for the third but again failed to make an impact and couldn’t find a spot thereafter, especially once Hughes returned to fitness and form. So he went back and played with Collingwood District, then Collingwood’s unofficial seconds side, where he spent several years as one of the better and most consistent tap ruckmen in the competition. He was even elected captain for 1912, at just 22. His height was a decided advantage at the lower levels, but he just didn’t have the extra skills needed to flourish at the elite. He moved to Panton Hill after shifting from Collingwood in the 1920s and became an orchidist. He also developed into an important community figure around his new home, becoming president of the local football club and helping to found a new competition, the Panton Hill Football League, after the Second World War (it lasted until the late 1980s). He played cricket for the local club into his 50s, and was also involved with the local fire brigade (he lost livestock and buidlings in a devastating fire at his property in 1933). With such a busy local life it’s perhaps not surprising that Andy Duff ended up living to the ripe old age of 90 – probably still dreaming about those two games with the Magpies back at the start of what turned out to be a premiership season.